I’m fine. I dislocated my knee this morning and sat on the floor for half an hour wondering how to get up and get all the kids breakfast before school, or if I would manage to drive to get them there, (big sigh). That means that I’ll miss coffee with the girls : ( So commonplace are scenes like this that one of my children didn’t move until the adverts of his favourite TV show to wander out to the kitchen to see if I needed anything. I’m fine. My wrist gave way as I lifted a pizza out of the oven for lunch, this made me catch the tray on the counter which in turn made me bounce the tray down my other arm leaving three lovely zebra striped burn marks. I’m fine. A cover teacher forced my son to participate in PE even though he communicated his pain, she didn’t believe him and joked unkindly that he should see a doctor (he’s seeing many). This teacher will never regain his trust. I’m fine. I can’t seem to take a breath today, it is shallow and fast as my autonomic system is struggling to balance itself. I feel like I’m wading through mud. I’m fine. I stepped on a stone at the end of a really nice walk, literally 10 yards from the front door. I sprained my ankle and went over like what only can be described as a see-saw; ankle, knee, hip, elbow, shoulder in perfect succession, finally stopping as my face skimmed the floor. Managing to cut open my leg through denim. 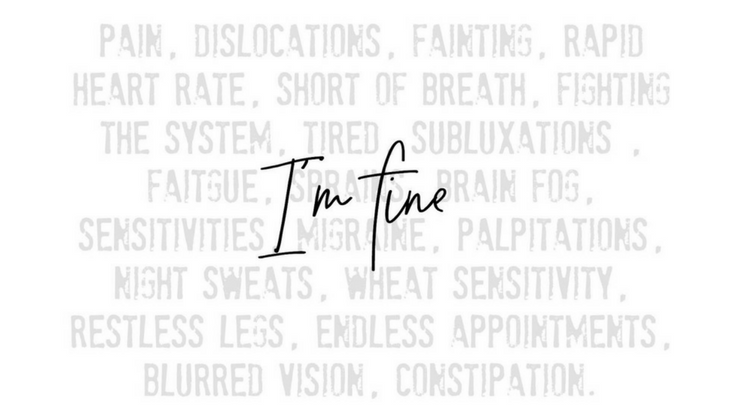 I’m fine. My daughter is screaming uncontrollably in a combination of pain, exhaustion and helplessness. After pain relief, a massage and a warm bath I can do no more to help her but to gently hold her and re-assure her that she’ll be OK.
I’m fine. I fell twice out for a walk while pushing my daughter in her wheelchair. Today (well most days actually) walking without looking at my feet seems to render me incapable of staying upright at all. Two scabby knees and a cut on the top of one foot and I’m beginning to regret wearing shorts. I’m fine. We’ve spent the last 12 hours being sent across London from one hospital to another for emergency brain scans on our son after they found pressure behind his eyes and his peripheral vision affected, thankfully they rule out a mass. The longest… 12… hours… of… my… life. I’m fine. I get barely any sleep and when I finally get up I realise that a bone has subluxated somewhere in my foot. Weight bearing is agony, actually, sitting is agony. But the kids have an early orthotics appointment at the hospital, church services, school, so I brace my foot as best I can. I manage to get a physio appointment 5 days later to manipulate it back into place. I’m fine. I learn that my child’s class teacher has decided (all by herself) not to apply her shoulder brace for the last six months in school, the very thing to keep her shoulder safe from a dislocation during play times and PE. I’m fine. As I stood up in the middle of my Pilates class to change position from lying to standing the sudden pooling of blood in my legs and the inability of my heart to pump enough blood to my brain makes me come over hot and clammy. As if in slow motion the room started to spin as I began to pass out. I’m fine. My son comes home tired, really tired to the point he can barely string a sentence together. I learn that his new teacher is refusing his requests for water in the afternoons even though the importance of hydration is clearly written into his care plan. I’m fine. Sometimes talking to my friends I feel like I live in a parallel universe as their lives, worries and hopes can feel a million miles away from mine. I’m fine. I had a wonderful day out with my family yesterday. Walking, laughing, picnicking, hey, we even managed a little dancing. Today, I am paying for my fun. Breathless, Potsy, my heart does not know what it is doing and I struggle to even sit awake on the sofa. I’m fine. I don’t know if I’m coming or going this week. School meetings to plan provision and care plans, more meetings to educate staff, reviews in physio, telephone calls to sort OT, I must call the EWO. Then on Thursday and Friday autonomic testing at the National Hospital that I’ve waited 18 months for (that I know will flare my POTS). Could I cancel? Should I?? I’m fine. My daughter yelps every time that she moves in bed as her hip partially dislocates and I read her to sleep to distract her from the pain. I’m fine. I fell spectacularly into the Thames as I save my daughter from stumbling along a narrow bank. Spraining my ankle and doing something to my right arm that leaves me incapable of holding a cup of tea. I’m fine. It’s my second migraine in three days and this one has really floored me. My arms are heavy my face is numb and I feel like a brass band are playing in my head. I’m fine. Today I practiced true calmness under pressure as my son went into shock after a bad break of his wrist BMXing. I kissed him as he closed his eyes in theatre to manipulare the joint back into alignment and my heart broke a little. I’m fine. I’m on my way to Brunel University with the head of the Child Development Centre to present to a full lecture theatre of physiotherapists for an hour or so. Everything that I need them to know as practitioners before they work in paediatrics, with children like mine. The last time I stood up in front of so many people they were all four and it was my Nursery Class. I’m fine. My rib is out, subluxated. As I drive to school to collect the kids I still cant get it to relocate and as I stand in the playground making small talk it really hurts to breathe. I’m fine. The two little words that have become the mask I hide behind to cope with my normal day to day. I like those words, they help me show the world (and my kids) there is more to life than this, I don’t know where I would be without them. Did you like this? You’ll definitely like How I fake My EDS Symptoms. It was a really popular post when the Mighty Site Featured it in early 2016, read by over 50,000 people in its first week alone. Enjoy.